Wailua River on Kauai is known for being the only river in the state of Hawaii that is navigable with anything larger than a kayak. The river begins as rainfall that collects into two main forks flowing down from Mt Waialeale at the center of the island. Both of these forks are joined by numerous streams along the way. 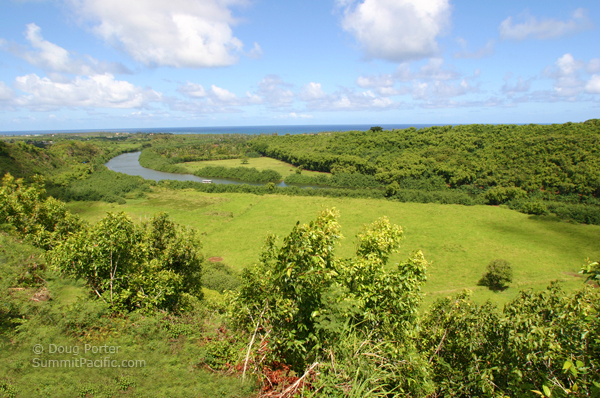 From the confluence of the north and south forks, Wailua River is wide and slow as it flows about 2 miles to Wailua Bay on the east shore, near the town of Wailua. North Fork Wailua River begins very near the highest point of Waialeale known as Kawaikini, which is 5243 feet above sea level. Total distance traveled from the beginning of the North Fork to Wailua Bay is about 20 miles. South Fork Wailua River begins at the confluence of Waiaka Stream and Waiahi Stream. About 3 miles downstream from this confluence it pours over an 80 foot, double waterfall named Wailua Falls which was featured in the opening credits of the TV show Fantasy Island for many years. Opaekaa Stream flows into Wailua River after plunging 151 feet (46 m) over Opaekaa Falls. There are several other tributaries of the river with waterfalls that can be explored by kayak. Fern Grotto is a lava rock cave along South Fork Wailua River that has been a popular tourist attraction for many years. Encircled in lush green foliage, the roof of the cave is covered in hanging ferns. Access to Fern Grotto is by tour boat. Kamokila Hawaiian Village is a 4 acre reconstructed ancient Hawaiian village along the banks of the Wailua River near Opaeka'a Falls. Its location is significant because King Kaumuali'i was a one-time resident here and the location was said to be his favorite residence. It is also where he assembled his war canoes to defend Kauai from neighboring islands. 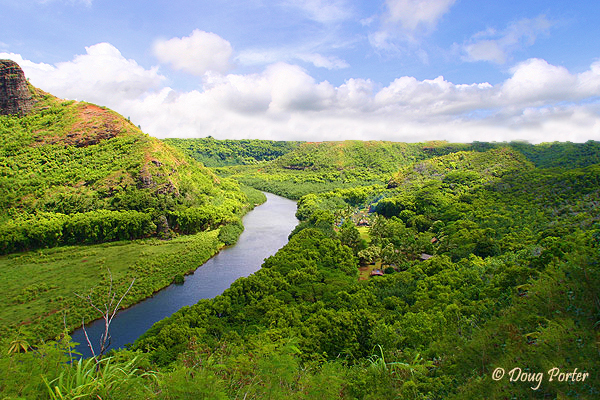 Since Prehistoric Times, Wailua River has been an important part of Hawaiian Culture. At the mouth of the river are several large rocks with petroglyph carvings on them. These rocks are continually buried, uncovered, and then buried again in sand depending tide and river flow. Today, Wailua River and its tributaries continue to be important as an attraction for sightseeing, hiking and tours and as a center for numerous water activities. 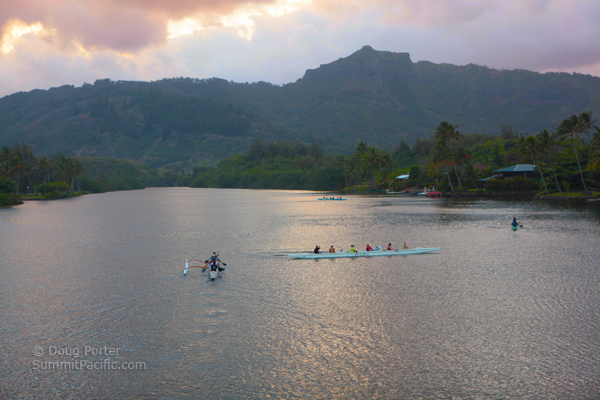 Waterskiing, kayaking, cruise boats and outrigger canoeing can be observed from Mayor Bryan J. Baptiste Memorial Bridge in the town of Wailua. Kauai Vacation Rentals nearby include Wailua Riverside Cottage, Waipouli Beach Resort, and Islander on the Beach.